Check your emails! Earlier today, Samplesource sent out a link with a survey to complete regarding the Free Sampler Pack from the spring edition! If you requested a sampler pack and received it, you are required now to complete a short survey to rate how you liked the product samples. Your feedback opinions matter and shape what samples will be included next time around. It is important to know what you liked, didn't like, especially about the products you tried. Please note, sampler packs are not available right now, the next round is in the fall. This survey is for those that already received samplers from the spring edition. Look for the email from Samplesource and follow the link in the email to complete the survey, we can't share it here, the link is unique to your account. 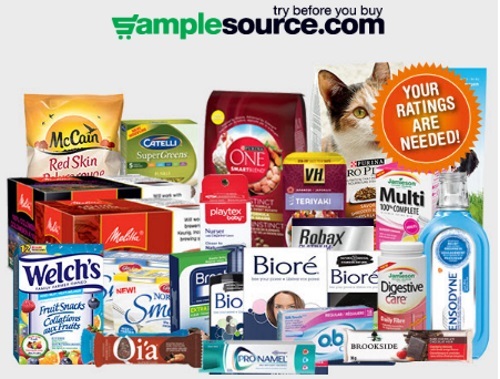 Click here to see what I got in my Samplesource Spring Free Sampler Pack. Click here for more details about Samplesource. Actually, just finished completing mine before going on facebook. Always enjoy giving my opinion.